Design to simulate pickup at different RPM to test TCI, CDI, Tachometers, Power valves and ignition coils. And to extract the advance curve from a Digital TCI or CDI. READY TO USE unit available for sale in the SHOP section. KIT available for sale in the SHOP section. Range 1000 to 12000RPM in 12 steps. Simulate a Hall sensor (square +12v signal). Adjustable width from 10 to 60 degrees. Imitate a VR (Variable Reluctance AKA Pickup coil) with both polarities: Positive than Negative or the opposite. Simulate a rotor bar length that define the delay between first and second sine. The “length” is adjustable from 10 to 60 degrees. 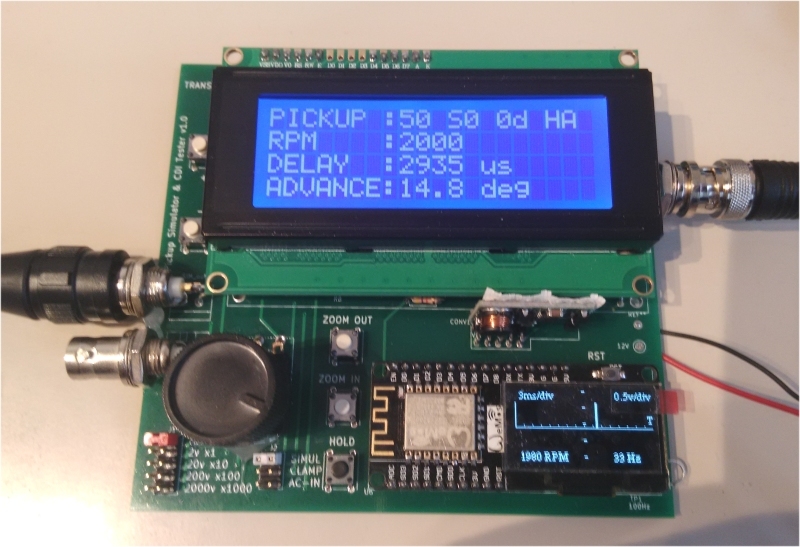 With the help of a Capacitive Probe hooked to the sparkplug wire, this tester can time the duration between pickup and spark and display the advance timing of the TCI/CDI under test. The start of timing is selectable between First or Second sine. Cannot test simple analog CDI like GY6 (using only resistors and capacitors) as the advance timing comes mainly from the VR, not from those CDI. Tester comes along with a simple but useful one way scope! Display the pickup signal generated. 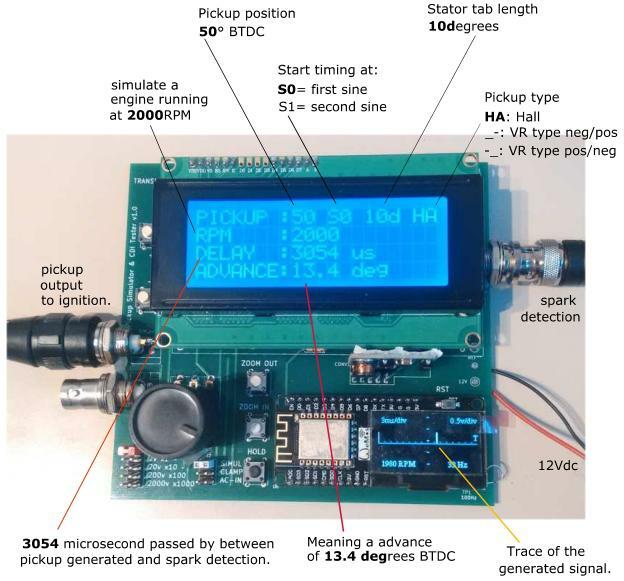 Display the sparkplug signal captured by the capacitive probe. Can be used as a simple scope. 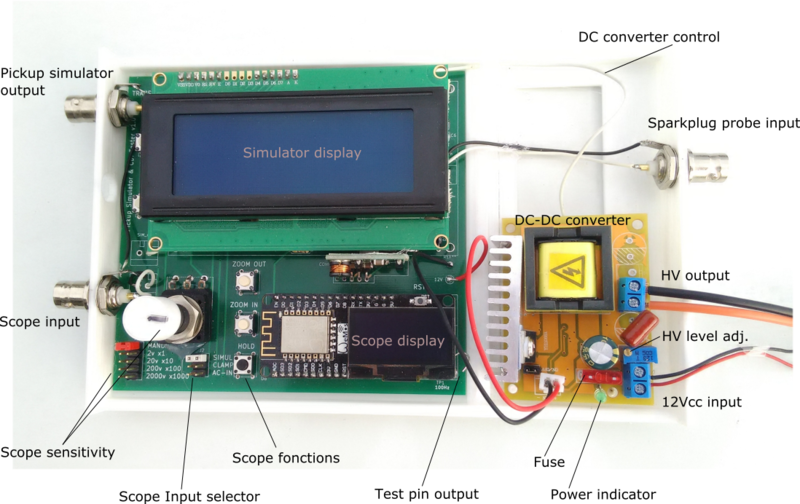 Display can be freeze with HOLD button in order to analyze, take photo, etc…. Automatic Trigger to stabilize trace. Test pin puts out a 100Hz test square signal to test probe and scope. 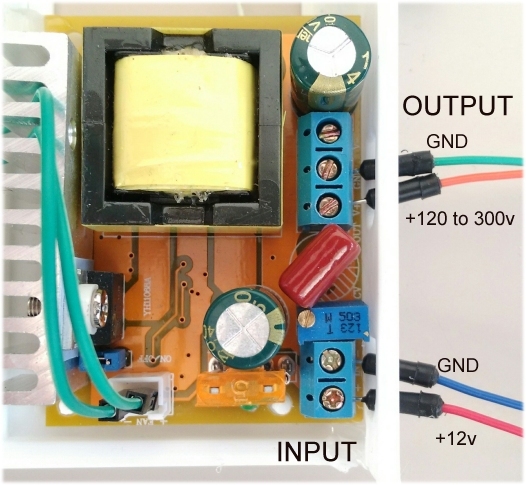 The PCB ground will be connected to the voltage! DON’T touch the input selectors when applying voltage! ALWAYS disconnect input BEFORE changing sensitivity jumpers. Needed to test AC-CDI boxes, this module generate 300Vdc from a 12Vdc battery. How to configure the CDI Tester? Initial release as an upgrade of Simulator V3. Que precio tiene el probador de Cdi , tic? Vivo en colombia, es posible enviarlo? and around 80€ built with High Voltage DC converter to test AC-CDI. Great New tool you have developed. Congrats. Can you put up a video here to see it working? Need to discuss a different sort of rotor with 3 bar lengths. I had developed the TCI for It. But can we modify this tool /code to get exact timing data from that setup. Can send you pics of the rotor. I begun to add some videos on this page. 3 bars, I never saw that! Why 3 signals for a single cylinder? I drive pin 5 of LM358.